ICC Cricketer of the Year 2017 Virat Kohli has moved ahead of ICC Cricket Hall of Famer Brian Lara in the all-time career-high MRF Tyres ICC Player Rankings for Test Batsmen, which were updated today following the conclusion of the Johannesburg Test. 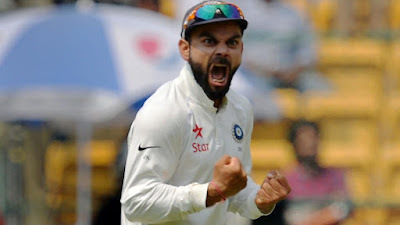 Second-ranked Kohli had started the third and final Test on 900 points and earned 12 points following contributions of 54 and 41. This means he is now on 912 points and in 26th position on the all-time list, which is headed by Don Bradman (961 points). Current number-one ranked batsman Steve Smith is second in the all-time list on 947 points. While moving from 31st to 26th position, Kohli has leapfrogged Lara (911), Kevin Pietersen (909), Hashim Amla (907), Shivnarine Chanderpaul (901) and Michael Clarke (900). Kohli now has his compatriot and ICC Cricket Hall of Famer Sunil Gavaskar - who peaked at 916 points following The Oval Test against England in 1979 – firmly within his sights. The India captain will now aim to gain five points and move ahead of Gavaskar either in the one-off Test against Afghanistan in June or during the five-Test series against England in August/September. Other batsmen to improve their rankings after the Johannesburg Test include Amla in seventh (up by one place), Dean Elgar in 12th (up by two places), Ajinkya Rahane in 18th (up by five places), while those heading in the wrong direction are Faf du Plessis in 14th (down by two places), Lokesh Rahul in 20th(down by two places), Quinton de Kock in 27th (down by seven places) and Aiden Markram in 48th (down by 10 places). There is no change in the top five of the MRF Tyres ICC Player Rankings for Test Bowlers, where James Anderson comfortably leads Kagiso Rabada, Ravindra Jadeja, Josh Hazlewood and Ravichandran Ashwin. India’s trio of Bhuvneshwar Kumar, Ishant Sharma and Jasprit Bumrah are also on the charge. Kumar has entered the top 20 for the first time in his career after lifting two places to take 20th position, Ishant Sharma is now in 26th spot after rising three places and Bumrah is at a career-high 46th position after vaulting 36 places. Kumar and Shami have also improved their rankings in the all-rounders’ list, which is still headed by Bangladesh’s Shakib Al Hasan. Kumar has lifted eight places to join Rabada in 12th position and Shami has moved from 27th to 17th.